LibreOffice 5.3 is the newest version of the popular open source Office suite, and one of the "most feature-rich releases in the history of the application". The Office suite, available for Windows, Mac and Linux operating systems, is now also available as a private cloud version, called LibreOffice Online. 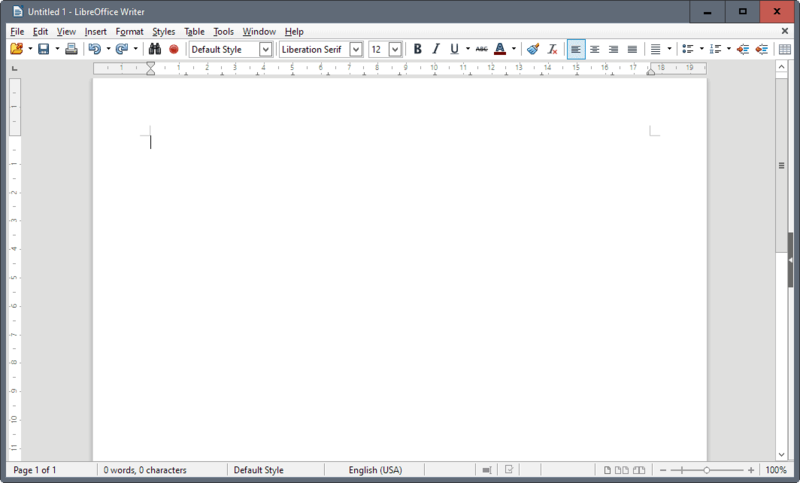 LibreOffice, at is core, is an open source alternative to Microsoft Office. It features Writer, a text editing program similar to Word, Calc, the Excel equivalent, Impress which is similar to PowerPoint, and Draw, which enables you to create graphic documents. LibreOffice 5.3 ships with a truckload of new features. One of the new features is a new experimental user interface called Notebookbar. This new interface resembles Office's ribbon UI, but is completely optional right now. In fact, the new user interface is not enabled by default, and if you don't look for it or know where to look, you will probably notice no difference at all to previous versions. First, you need to enable experimental features by checking "Enable experimental features" under Tools > Options > LibreOffice > Advanced > Experimental features. To enable the new Ribbon UI, select View > Toolbar Layout > Notebookbar. The UI you see on the screenshot above is enabled by default, but you may switch it using View > Notebookbar to either Contextual Groups or Contextual Single. The former displays grouped items in the UI, the latter icons in a compact horizontal row. Excellent for small resolution devices. As far as other features are concerned, there are quite a few that deserve mentioning. One interesting option that the developers built-in to LibreOffice 5.3 is the ability to sign PDF documents, and to verify PDF document signatures. You find both options under File > Digital Signatures in the interface. PDF documents can be embedded into documents now as well. They are added to documents as images, with the first page being shown by default. 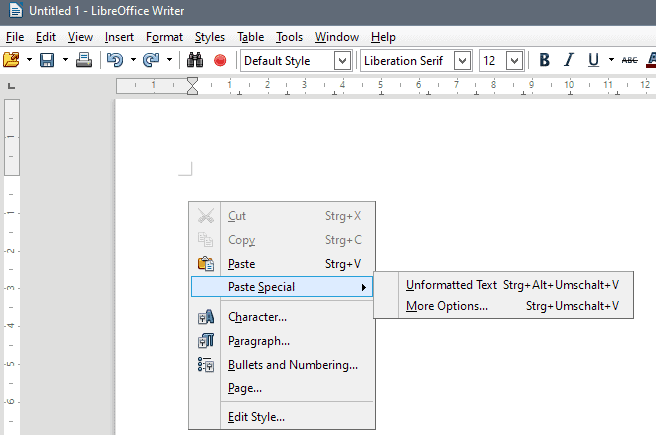 If you like to use the keyboard shortcut, you may like that the Windows and Linux versions of LibreOffice 5.3 highlight shortcuts now in context menus. So, whenever you use the mouse, you see the corresponding keyboard shortcut as well. The Writer application got some exciting new features. It supports Table styles now for instance, and there is a new Page deck in the sidebar to customize the page settings quickly and directly. There is also an option to use the new "go to page" box, and arrows in the drawing tools which were not available previously in Writer. Calc got a new set of default cell styles offering "greater variety and better names", a new median function for pivot tables, and a new filter option when you are inserting functions to narrow down the selection. Impress & Draw start with a template selector when you start them, and two new templates have been included for use. Another interesting option is the ability to link to images or photos of photo albums, so that they are not saved in the document directly. LibreOffice 5.3 supports better import and export filters to new and legacy Microsoft Office Documents. Check out the official blog post on the Document Foundation website. There you find links to download pages, and information about LibreOffice Online. Now You: Which Office suite do you use, and why? I switched from MS Office 2010 to LibreOffice when I retired three years ago. I’m disappointed that they have added one of those idiotic ribbon interfaces to the product; I really do hope that it will always remain optional. Nice alternative to MS office but it needs Java runtime (JRE). Unfortunately I don’t like that so I have no use for Libre. Just in case you need Java – there is portable version, too. Switch off Java – Start LibreOffice, go to Menu – Tools | Options | LibreOffice | Advanced and uncheck “Use a Java runtime environment”. Thank you, guys. I will try it and see if the extensions I need to use will work. Always happy to come here because of the good advice. Again, thanks. You don’t need Java for LibreOffice. I don’t have Java installed and never had any problems or requests for Java form LibreOffice. I use the portable version for years. Never liked MS Office and never used it. Why on earth have they removed the ability to change the size of the menu bar text? In 5.2 you could go to Tools > Options > View, and change ‘Scaling’ to 125% to make it readable. In 5.3 they’ve removed it and the menu bar text is tiny again. All you can change is icon sizes. It’s something I’ve started to notice more and more. Do developers think everyone has 20/20 vision or something? Or do they maybe only test it on laptops, where scaling in bumped up at an OS level? Yup, I have the same feeling. That was must-have feature and now I find difficult do use my LO. Have to find a solution! Unfortunately, Microsoft Office is a must professionally. It is bloated like a dead body floating in a lake, but provides recent functionality that seem to be (?) absent from LibreOffice or OpenOffice (OO had about 8 times more users than LO last time I checked, so professionally it’s better to be proficient with it if Microsoft Office is out of the picture), namely data analytics tools. They’re not even enabled by default in MO. Do they exist in recent versions of OO or LO ? @Socrater: Can you please be a bit more specific as of *which* tools/functions you are missing from OO/LO? I would be very interested to see a list here. (Pivot Tables does not count, since that is a licensed MS function). Are you sure about what you said about OpenOffice versus LibreOffice? Last September or so, I read that development of OpenOffice had declined to the point that Apache was considering retiring it. I believe you forgot to tell your readers that you first need to enable Experimental Features before being able to turn on the “Ribbon”. Oh, you are right. I had this enabled already on my version. As Richard says above, you need to turn on experimental features first to get the ribbon. I’ll not be using it, but I can see the value of familiarity for anyone moving from MS office. I switched to LibreOffice from OpenOffice as my main office suite right from the first version and would certainly recommend it. Though I must confess to still running MS Office alongside LibreOffice on my laptop for for the 1% of the time that compatibility is a problem in a professional setting. The ribbon is a HIDDEN, alternative, experimental option that you need to activate under Advanced Options. Its not like it got forced upon you. You can continue to use the existing GUI. I know, but with TextMaker no problem will spellchecking, the display of letters etc like LO, finally that ribbon decided me to move on. Those ribbon tabs are crying out for some padding. Latest News: Brian Griffin Gone Forever. Once Again! Say what you will about WordPerfect, but I used WordPerfect (5.1? 5.2?) for DOS for years — it was once the gold standard in American law offices — and I never encountered a single bug. Not one. I don’t think I can say that about any other word processor I’ve ever used. Well, maybe WordStar for CP/M and DOS, but that’s so far back I can’t even remember what version numbers I might have used, let alone any bugs I might have run into. Ugh. That Ribbon interface was the reason I gave up Office years ago. It’s a good thing Libre’s product updates are optional and not forced like other software, so I can keep my current version of LO for as long as I want. Its a HIDDEN experimental option under advanced options. Its not like it got forced upon you. As long as it is a option its fine by me. In theory, I love the idea behind LibreOffice. In practice, however, I have found it very unreliable. It crashes all too often. I have tried reporting bugs and issues, but found some members of their team (including one of their Board members, Joel) to be nothing short of obnoxious and rude. Consequently, I no longer report bugs or make donations to The Document Foundation. My experience has been similar, and I have found that this is true for many similar projects. I suppose the authors might tend towards a socialist “software should be free” mindset, even if that puts their software ten years behind. While I can get behind the idea of LibreOffice, I don’t have much good to say about it. I also remember the authors for trying to force their users to use a download button as save button because “floppy disks are out of date”. Gnumeric and Abiword are far better projects than LibreOffice imo. I would advise anyone considering LibreOffice to give those a go. They’re lightning quick, small, portable, and reliable. They are excellent. It’s a shame Martin seems to favour LibreOffice and doesn’t report on these alternatives. Actually LibreOffice is one of the most well-maintained open source projects with about 20 or 30 paid developers working on it (from Redhat, Collabora, Canonical, CIB and many others). These companies have an economic benefit if the software is ten years ahead, not behind as you stated. A source is obviously needed for this dubious claim. The last major release of Gnumeric was in 2012. The last major release of Abiword was in 2013. So, obviously they don’t have much development behind them, while LibreOffice has added in the last few years a great deal of features. It makes sense that it will be covered a lot more in the press or news sites. I don’t use these 2 programs often, but I think Gnumeric is a very nice little program, in fact it’s more precise and accurate in some areas than the alternatives (floating points), especially if you are doing scientific calculations. I find that it takes a lot of work to report LibreOffice bugs. If you want a useful response, you have to delineate the bug as clearly as possible and provide relevant background information. Sometimes you may be asked to test it on older versions of LibreOffice, to help identify whether it is a bug inherited from the original OpenOffice code or rather a regression. This requires doing “parallel” installs of older versions, and even though there is a utility that automates parallel installation in Windows, there’s a learning curve, it’s time-consuming, and it can take up a fair amount of drive space. (LibreOffice is not a small program. I have a little over 28.5GB, or around 15.5GB compressed, of LibreOffice parallel installs for the purpose of regression testing, although I also occasionally launch LibreOffice 3 and 4 to be able to use extensions that are not supported in later versions.) On the one hand, you have LibreOffice coders, many of whom are volunteers, who cannot fairly be asked to read bug-reporters’ minds and do all of the groundwork for them, and on the other hand you have a lot of non-coder users who feel overwhelmed by the challenge of submitting a useful bug report. I don’t think I’ve ever run into outright rudeness in the support forums or bug-reporting site. Some of the bugs I’ve reported were casually dismissed by some LO support guys but were reinstated when I provided grounds for doing so. And LO contributors from Red Hat have been very responsive, in my experience. The pace of bug fixes has been frustratingly slow … but then again, I fondly remember an Excel column autofit bug that took Microsoft ten years to finally fix. And to be honest, I’ve seen just as much “blowing off” of bug reports in Microsoft support forums as I’ve seen in LibreOffice’s. Am I the only one fiddling around with WPS Office (formerly Kingsoft)? Most reviewers say it’s more compatible with MS Office than Libre Office or the others, and I’d have to agree. I’ve used it off and on and moving documents from MS Office at work and WPS Office at home is seamless. I’ve had problems with losing formatting with Libre office, but WPS seems to work for me.. I have fiddled with Kingsoft Office. I can confirm that it has better compatibility with MSO files than LibreOffice, but that’s a pretty low bar to beat. I can also confirm that Softmaker Office has even better MSO file compatibility thank Kingsoft. It retains advance DOC and XLS layouts better than the rest. You’re kidding me. I installed Softmaker Office and uninstalled after a few minutes. It’s like I installed Microsoft Office 97. It’s not that epoch. Hate that damn ribbon. Sad to see it infect LibreOffice. It’s experimental, it’s optional, and given the large number of people who hate the Ribbon, I suspect it will remain optional for some time to come. I loathe the Ribbon interface. I’ve tried Libre Office (at least three times) and didn’t care for it even without the ribbon. My solution is Softmaker Office. It does everything I need and more, is very compatible with MS Office, and the company is quick to add suggested features. I’ve also tried WPS Office and that would be my second choice if it weren’t for the (yearly) subscription. Also, the last I checked it was showing the ribbon UI. Maybe the user has a choice, but I don’t know. @kalmly – WPS Office is a free application. They have a ‘pro’ version that is networked through different computers in a single office, and it has a cost, but the one I’ve been using is the free version. Unfortunately, you are correct about the ribbon, but at least it is almost identical to the MS Office platform in appearance in usability. And FWIW, I hate the ribbon in all the MS applications. But it’s the standard now so if I’m going to have to use it at work, and share it’s use with others, then I need commonality across the board. If it were just me, working alone at home, then I’d go for simple. Unfortunately, most people are plugged into a professional environment that is bound to the MS Office platform. 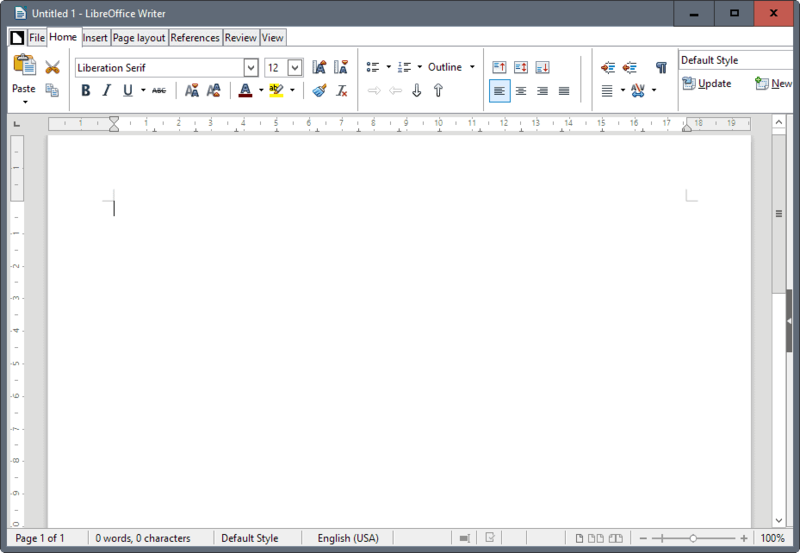 Finally, the interface on LibreOffice is dull and old. The ribbon interface is much more modern. modern?? you say fancy. but not practical and very unproductive. Libreoffice was better when they have full right click format options. I really dont now Who think that change something logical, practical and intuitive to a cut version is make LO better. works perfectly on my trusted xp machine. I hope they don’t ever remove the traditional GUI. I’m not optimistic. How do you make MS Office portable??? If you don’t want to post publicly let me know and I’ll send you a private email addy. Secondly, the Document Foundation wasn’t kidding about the NotebookBar (~LibreOffice Ribbon) being an experimental feature. When I tried it out in Writer 5.3.0.3 Fresh, the main Menu bar — you know, the one with Tools > Options and View > Toolbar Layout — disappeared … and I could not find a way to go back to the default toolbar layout! I dug around in my profile and found a likely line for a manual reset in registrymodifications.xcu, but I couldn’t find any documentation for the setting in a reasonable amount of time, so I just replaced the whole file with a recent backup copy and that fixed the problem. Still, it shows (at least in my case) that the new feature is not ready for prime time. Also, the NotebookBar seems to offer a really limited number of functions, at least currently. I have a bunch of custom toolbar buttons for running macros and the NotebookBar is not customizable, so it’s a non-starter for me anyway. I was just curious. To get the Menubar back in NotebookBar mode, click the document icon in the upper left corner (left of the ribbon tabs), and choose “Menubar”. It’s still limited (not to mention ugly), but that’s why it’s an experimental feature. I’ve read that .docx compatibility has improved, which is arguably more important than the ugliness of the GUI. Tell you what — once I’ve resumed using LibreOffice more heavily again, I’ll try to remember to update my impressions here. I upgraded LibreOffice to 5.4.0.3 today and with limited testing and exploration I’m very pleased with the release under Windows 10 x64 Home. It looks prettier, as ribbons go, than this LibreOffice’s implementation. But the ribbons can go die in a fire.